publication – St Mallory's Forever! A modern take on the boarding school mystery genre. Exe-tra, Exe-tra, Read All About It! 3, 2, 1… LIFT OFF! What’s that excitable post title about? Why, it can only be that St Mallory’s has finally come out! Yes. It has. In fact, St Mallory’s Forever was technically published on the 21st January, which means — get this — that I was still sixteen. By about five minutes, if Mark is correct about the timing. See, my birthday was the 22nd, and I was due to be turning seventeen. Still fairly young to be published, but who wouldn’t leap at the chance to be published at sixteen, instead? Well, we did what’s called a ‘soft launch’. For a start, Amazon took a while to upload it, so it didn’t go live until the morning of the 23rd. And at the time of uploading, we hadn’t quite finished proofreading and formatting, and we weren’t sure there wouldn’t be random glitches, like finding unexpected QQQs around italics. Yesterday, therefore, Charley and I had downloaded it to our Kindles and were frantically reading through, keeping note of any typos or formatting errors (which I was doing on my phone, and I do not recommend it, but I was in school and had no choice), and Mark was updating it. In theory. As a matter of fact, he lost the internet for an entire day, because of his location, which made it even more stressful. Oh, and then he wrote a foreword, and told me until I could see that foreword when I clicked “Click To Look Inside” on Amazon, I couldn’t tell you it was out. Nevertheless, somebody clearly bought it because we managed to get into the Top 100 in Kindle Store > Books > Fiction > Children’s Fiction > Literature > Humourous — a fairly narrow category, I imagine, but we stayed on that chart all night, which I figured was pretty impressive. Today I got online and checked the ‘click to look inside’ … and there was a foreword. And the blurb had been uploaded. Okay, so it wasn’t quite linked to my Amazon Author page (but will be soon), but other than that, all seemed to be ship shape. It was official. 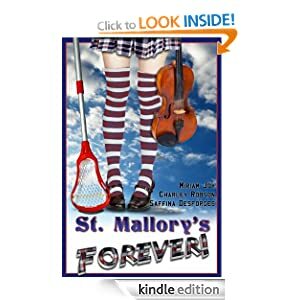 St Mallory’s Forever was published and available. Is published and available, I should say. And I decided to rob Charley of the joy of telling you it’s been released, mainly because, well, I got there first. St Mallory’s Forever! is available on Amazon UK and Amazon US. I don’t know for certain about other platforms yet, but I know Mark said they might take a little longer, so I will update this post with links asap! St Mallory’s Forever! – the blog tour! As I type, we are moments – perhaps more literally than one would think! – away from releasing our lovely wee creation to the world. As you have probably gathered by our VERY long radio silences, we’ve been an industrious lot during this time. Not in the least because Miriam and I had a bash at what I like to think of as a sort of baby blog tour. If you’d care to know, there’s a pretty wicked Interview With the Notebook Sisters, which is full of all sorts of tasty tidbits that we didn’t tell you about in the process of writing St Mall’s. Not long after, I wrote a Post for Pure Grace, which is likewise full of wonderful goodies. And there’s a puppy in it too! While not specifically on the tour itself, Saffi’s Promo Post is worth a look. Not in the least because you’ll get to meet our lovely publishers and experience their awesomeness firsthand! Random Writing Rants were also very kind to step up, and the equally wonderful Miriam has done a wicked post for them on the how and why St Mall’s came to be. She’s also much better at explaining things than I am, so you should totally go and check it out. And last, but certainly not least, the lovely Taylor over at Taylor Lynn Books has kindly hosted another Interview With Charley. If you ever wanted proof that interviews are awesome, this is the place to go. In the meantime, stay tuned on our Facebook page, or our personal blogs should you happen to follow them, because those who lurk well will be among the first to know when St Mallory’s Forever! goes live. Just a very quick note to say that we’re burning the candle at both ends to get St Mallory’s Forever! finished and published by the date we provisionally set — the 22nd. Even though we still can’t guarantee it exactly, we’re doing our best. Here’s sort-of proof in the form of an email! We’ve also been working hard at promotion so expect some links here to guest posts that we’ve done for various people on the internet who were nice enough to give us a soapbox to stand on. I’m afraid I can’t write any more … I’m supposed to be harmonising a Bach chorale and am stuck on the imperfect cadences. Does anybody have any ideas? (It’s at times like this that I wish St Mall’s Helen was real and could help me…) Ahh, the trials of trying to publish a book while still at school. The Promo Video Is Live! If you’re the sort of person who uses Tumblr and might be persuaded to reblog it, you can find it here. Otherwise, please share the video however you tend to share things, and spread the word about St Mallory’s! Mark sent me an email this morning with the subject line “St. Mallory’s Forever! is imminent. Time to get serious.” Talk about not freaking out your co-writers when they wake up – I read it on my phone while still in bed and promptly killed predictive text trying to reply when the only thing I could manage to say was asdfalskdjf;wakjsdfalsdkf, affectionately known as keyboard smashing or ‘typerventilating’. You see, St Mallory’s Forever! ought to be coming out this month. Although things often do not go according to plan, we were hoping for the 22nd as our official publication date, which just happens to be my seventeenth birthday. We’re working on the final draft, tweaking and proof reading and making minor alterations (and I am sitting here confused by Mark’s formatting gibberish given that to send things to Kindle, I usually just run them through Calibre and they come out as shiny, fully functional .mobi files with contents pages… but hey). Mark sent me promo images to use and if you’re reading this in an email, you may want to click through to see the new design of the blog, which utilises some of them. Of course, it’s collaborative, which means not only do we all share the credit, but we all take the blame. Reading it through, it doesn’t sound like me, or Charley, and I haven’t read enough Saffina Desforges to know if it sounds much like them but I’m willing to bet it doesn’t. It’s not my usual genre or style. My characters are normally bitter, twisted and often non-human, a far cry from the excitable teenage girls of St Mallory’s. Yet I see things that I know I wrote, even if they’re not my usual style. Okay. So it’s mine. And it’s Charley’s and Mark’s and Saffi’s. But soon it will be yours. It’ll be coming out as an e-book first, instantly to Kindle and Nook although Mark warns me it might take a little longer for it to filter through to other platforms. Then, in February, we’re hoping to have it available as print on demand. I had no idea the print book would be coming so soon, but apparently it is. That’s also freaking me out. Before, I was like, “Okay, people at my school might know about it and maybe read it, but I won’t know. Ha ha.” And now I’m like, “People at my school might read it and I WILL BE ABLE TO SEE.” And they will judge me on it, even if they don’t say so. They will think that is what all my writing is like even though it’s not. Yes, I’m proud of St Mallory’s, but the idea of putting my name to … well, anything right now, is terrifying. After a year in which I don’t think I really achieved a lot outside of finishing my GCSEs, suddenly things are happening very fast. St Mallory’s Forever! has gone from what still seemed slightly like a far-distant possibility to a very real thing. It’s happening. It’s happening soon. Title shamelessly stolen from Miriam’s email tagline? Yes. Singing the theme tune in my head? Yes. Couldn’t sleep last night for excitement of telling all of you this? Yes. It’s official – the first draft of St Mallory’s Forever! is finished! Finito! Completa! Done! Words cannot tell how incredibly exciting this feels. There have been plenty of ups and downs and periods of absolutely nothing happening; exams, concerts, university application, ballet, moving house . . . the cosmos seemed to be conspiring against us. Just a little bit. Miriam is currently tackling GCSEs, while I am a year ahead getting chewed on by my AS Levels. Both of us are currently on Study Leave, doing battle with a variety of ideas that we’re supposed to know but swear we never studied. For me it’s Descartes, Polkinghorne and Anselm, and for Miriam it’s incomprehensible Physics-related squigglies that supposedly explain the behavior of various whizzy-bouncy particle thingies. Subsequently, St Mallory’s Forever! has been somewhat neglected. It is currently sitting in my email Inbox, glaring at me malevolently and threatening to maim my brain cells the moment it comes within range. And, with any luck, it will have its opportunity as of Thursday, when all but one of my exams will be over. The moment we get the rough draft finished – and we get out of school for the summer – we both have every intention of editing at the speed of light, shoving it through the formatters, and getting it into your hands as soon as we can. In the meantime … a little more patience, please. Not much, just a bit. We promise. Live long and prosper, readers. We promise to be back soon. A collaborative project crossing continents and age gaps, St Mallory's Forever takes the boarding school genre straight into the 21st century. Book I – Available Now!